Yorkshire evening post aug 30 1935 p.5 “the church of “prester john”” – stories of the monarch who ruled chrsitian kindgome in Africa. Alvarez gives name to king of Abyssinia in early 16th, before that fabled shrien of st Thomas in india. EOC does teach “one of the most acient forms of primitive chrsitanity”. “The last part of Free Africa is perhaps the surviving stronghold of a very primitive type of Chrsitanity”. In the late 16th and early 17th century scholars published a Bible in the English vernacular, subsequently to be known as the King James Version. The strength of Prester John's legacy is perhaps demonstrated by the fact that, when the scholars translated the Septuagint (the earliest extant Greek translation of the Old Testament from the Hebrew), they turned most mentions of "Kush" into mentions of "Ethiopia". George Fox, the founder of the Quaker movement, made an early theological argument - at least by Europeans - concerning the harm of African enslavement in the Americas. Fox considered the "Ethiopians" of the Bible to be enslaved Africans. Soon, European abolitionists used Jeremiah 13:23 to argue for the end of slavery: ​"Can the Ethiopian change his skin, or the leopard his spots? then may ye also do good, that are accustomed to do evil." . 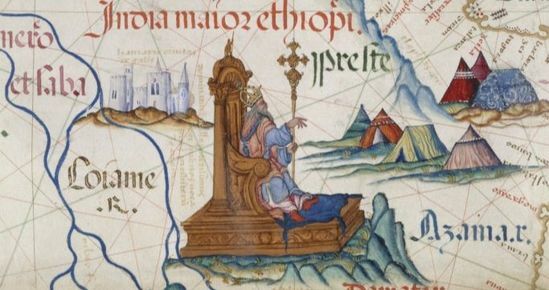 Click here to explore another famous occurance of Ethiopia in the Bible.